On average, U.S. Poison Control Centers receives phone call every 45 minutes about detergent pod accidents after a child or impaired adult ingests one after mistaking the bright, colorful pods for candy or puncturing the pod and having the caustic liquid squirt into the eyes. Nearly every major laundry manufacturer has their own version of the product: Tide Pods, Arm & Hammer Crystal Burst Paks, Gain Flings!, all mighty pacs. The learning curve on how to use the packs is simple to master. They are convenient to use, prevent overdosing of detergent and easy to transport to laundromats and communal laundry rooms. Because the single dose detergent packs are highly concentrated, the effects of exposure by getting the product on skin, or in eyes or by ingesting are much more severe than contact with a bottled or boxed detergent. Regular detergent usually causes stomach upset if ingested. But the single dose products can cause excessive vomiting, wheezing and gasping. Some children have breathing problems serious enough to need a ventilator to help them breathe. There are reports of corneal abrasions (scratches to the eyes) when the pack is punctured and the detergent squirts into a child’s eyes. If a child has ingested a punctured single dose laundry pack, it is vital to call your local poison center at 1-800-222-1222 immediately. A trained professional will talk you through the next steps to take. Take the time to post this number next to your land-line phone and program it into your cell phone. NOTE: If your child is not breathing or has trouble breathing, call 911 - not poison control. If the detergent has been squirted into the eyes, immediate rinse the eyes with a continuous stream of cool running water. It is best to rinse for at least ten minutes. It is best if the eyes are open and the water is running from the nose to the outer corner of the eyes to prevent contaminating the other eye if it is not affected. Always close resealable bags and containers tightly during storage. Several detergent manufacturers have improved the closing mechanism of their products to slow down curious fingers. Keep the packs in their original container with intact labels. Almost all laundry product labels contain first aid information and many have a Poison Control Center phone number. Keep cleaning and laundry products far away from food so that there is no confusion. Do not allow young children to handle laundry packets - especially children under the age of five or six. If you dispose of ruptured packs or several that have stuck together, place them in a closed container before adding to the trash. The safety of our children is a top priority in most homes. We all do our best to keep dangerous materials away from our children. But some things are just so tempting to a child that he or she will find a way to get their hands on it. That's why parents, grandparents and care-givers must be diligent about keeping products out of reach and be prepared to react if a disaster occurs. Caregivers to adults with Alzheimer's Disease, dementia or reduce mental faculties should follow the same safety guidelines as those who care for small children. While pets are not attracted to the colors, they may see the pods as a toy and pet owners should also be diligent about safety. These attractive, brightly colored detergent packs can look like candy to a child. 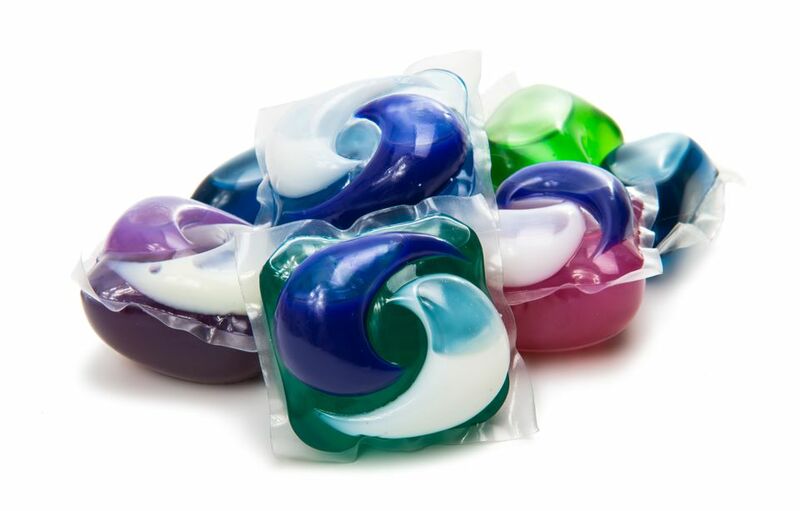 According to the American Association Poison Control Centers, more than 11,500 children were treated to exposure from a single-dose detergent pack in 2016. Manufacturers have made changes to improve packaging safety but is ultimately up to responsible adults to ensure the safety of little ones. Starting January 1, 2016 following legislative action, single dose packets in the European Union have a bitter coating on the packet film to dissuade children from biting into the packs. The packet also must retain liquid content for at least 30 seconds when placed in water at 20° C, or 68° F, and pass compression testing. 1. Adding an agent to the packet’s outer film that provides a “repulsive” taste. 2. Outer packaging that is not transparent or translucent. 3. Outer container that requires more skill to open. 4. Displaying new warning statements and safety symbols on container warning consumers of the dangers of ingestion or direct skin or eye contact. 5. Increase the strength of each packet’s outer film, making it more difficult to bite through. In August 2017, Procter & Gamble rolled out the new, harder-to-open Child-Guard™ tub for Tide PODS and Gain Flings with a lid similar to those found on medication, requiring the user to squeeze both sides and twist at the same time to open.